This year’s Fall Dance Concert 2018 featured a number of talented dancers in an array of different pieces. Beginning with Progress, dancers moved across a stage with an eye-catching geometric backdrop and paper covered stage. As the dancers moved across the stage, their feet disrupted the carefully laid sheets of paper, creating paths of disruption and making for an unusual and striking visual effect. Next came Machina, a dance characterized by a sense of urgency, wide reaching full-body movements, and synchronicity. In Out of the Void, smoke clouded the air as dancers emerged to the sound of a static soundtrack, an eerie atmosphere befitting the rolling of prone bodies across the stage. The following piece, Continuous Replay (1977, Revised 1991), juxtaposed dance styles, including what appeared to be tribal movements as well as some more classical elements. The Wisdom of Quiet then began with the sound of flutes as dancers slowly emerged onto the stage as if mesmerized. The concert closed on a hip-hop number, Intuitions, to great applause as music by Dua Lipa, Bruno Mars, Lauv, and Tyga accompanied this universally loved style. To an eye unaccustomed with dance, some of the pieces were admittedly difficult to interpret. What was the meaning behind the carefully laid paper in Progress? The disturbing and broken static-ridden music of Out of the Void? The dismissal of one dancer by another at the close of Intuitions? The note from the artistic directors at the beginning of the program addresses this question, approaching the matter head on: “A response we sometimes hear from the audience members attending a dance concert is, ‘I didn’t get it’… there is no right or wrong answer to what a dance ‘means’ or how it should make you feel; rather, each person sees something for him/herself.” The artistic directors of the performance thus invite the audience to glean meaning subjectively, arriving at their own interpretation. What was the meaning behind the carefully laid paper in Progress? To one member of the audience it was a statement on chaos, to another a comment on race. The disturbing and broken static-ridden music of Out of the Void? An interpretive simulation of a country experiencing war. The dismissal of one dancer by another at the close of Intuitions? A pithy representation of a girl dismissing male attention in favor of spending time with her friends. 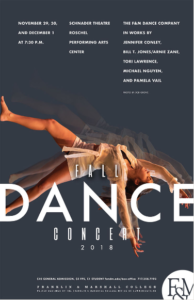 Thought provocative and an impressive display of physical ability, the Fall Dance Concert 2018 was a success. Senior Abigail Sokolsky is the Art & Leisure Editor. Her email is asokolsk@fandm.edu.